True or False: Your Vendor Results Are Skewed? Your Vendor Results Are Skewed? 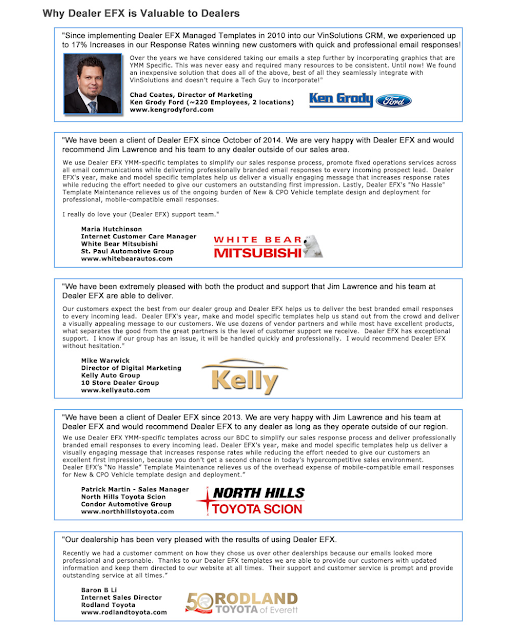 Every dealership in the automotive industry has some sort of relationship with vendors and their products. Whether it be for a CRM, Website Design, DMS, Email Marketing, Call Reporting…You name it and it’s covered by a business in this industry. And while most will have the main argument in their quest for your business, the age old pitch “We Will Show You The Results You’ve Been Missing”, this isn’t the largest transgression against these vendors. What is, and what this article will focus on, is the TRUE problem with so many in the automotive vendor industry; false & fluffed reporting of the results their products provide. Looking at the dealerships results, in comparison to what the vendor provides, is the key in a long lasting relationship with these suppliers. However, with so many dealer programs and vendors layering and clouding results, it’s become difficult to disassociate the good from the bad, no matter the size of the business. In some cases name recognition and sheer size of the vendor can make it simpler to be able to skew results. Viewing the warning signs for your vendors, and what they’re supposedly bringing to the table vs. what they’re actually doing for you, may help to clean house and find the right and TRUE product for your dealership. Here’s a quick guide in what to look for when being provided results from a vendor. Results that are vague & not analytical. Look at Google analytics for an example. When viewing stats on a reporting engine such as this, you’ll find a detailed (and sometimes frustrating) amount of information, which helps any user determine where every view, click, and exact lead came from, AND, how they got there. Now looking at many current automotive vendors, there’s only a select few who will provide true detailed views into how every facet of every lead has come through and how their product associated with this lead. A true reporting tool MUST show detail rather than a summary, and must give the dealership the chance to make the choice themselves, if they choose to do a deep dive into the analytics. Not the other way around. Reports showing the vendor’s product or service sold most of your vehicles. A dealership in most cases is a well oiled machine, staffed by sales personnel who spend all day with one goal; to sell cars. There is NOT ONE vendor in this industry that can attribute most of a dealerships sales to their product, it’s just not possible. An automotive supplier is there to help attain a dealership additional sales, more leads, and better organized growth and sustainability in the ever growing and changing automotive market. Unless the dealership has only vendors and no sales personnel whatsoever, there will never be a product to verify most sales can be linked to their product or service. If they do, it’s time to rethink who you’re working with. Product results that lead into a multitude of that same vendors’ other products. This is a tricky one, because there are many businesses who work with dealerships, who do have terrific additions to their arsenal of products. Where to be weary is when the reporting that is provided to the dealership specifically points in the direction of another product they provide. If it seems coincidental, it most likely isn’t. Tardy/Late Reporting. When using reputable vendors or suppliers, almost all of these will, at the beginning, provide a calendar of reporting to be expected. If reports and results are meant to be month-to-month, on the first, they should always be on the 1st. When the reporting becomes staggered and/or consistently late, in some cases it’s because the numbers do not reflect good on the product. Some may just be using a few extra days of data to bump the numbers, however some may be finding alternative methods to create “better” data in the eyes of the dealership. It’s not ethical, and it happens more than most would think. Too many vendors are equating a correlation to a causality; trying to influence dealers that because they may have had a slight touch on the customer, they must be the only one to award credit with that sale. This is not every vendor, but the number of honest reports is outweighed by the dishonest in so many areas. Preemptively targeting certain cautionary areas of vendors before signing contracts is a must these days. This must be done in order to find transparent companies that show every detail to better the dealership, not themselves. For example, automotive suppliers such as CRMSuite, and its CRM Software, provide detailed and analytical reporting with a complete layer of transparency. This allows the dealership management to oversee the entire operation without any of the cloudiness that appears in so many results and reporting by other vendors. Every aspect of all reporting needs to show the dealership, its personnel, and any outside eyes looking in, a complete view with no filters or gaps between the data and the ROI. Because, if that dealership cannot fluff their bottom line, why should any vendors be doing it?